From time to time you may find it necessary to have some restorative work done on your gate at home to ensure that it continues to add an element of beauty to your home, while keeping your premises confidently secure. 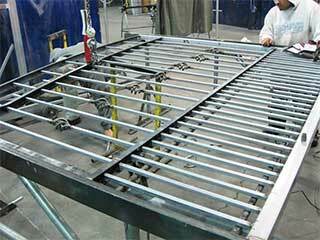 Driveway gates and their components work hard to ensure these functions, though they do so under many destructive elements. When you need to have your gate repaired by someone you can rely on, give us a call to find out more about our assortment of repair and maintenance services. Driveway gates are constantly exposed to the elements. Sun, wind, rain and cold will gradually take their toll on them. This means that they will eventually become the victims of rust or rot, which make them less effective and downright unsightly. If you would like to have your rusted or rotten gate repaired by a professional, speak to us for further details. Automated gates can make like much easier for a home, though their openers may need work from time to time. Their exposure to the weather, minor accidents and simple wear and tear are all common factors they have to constantly work against, which may cause them to fail eventually. If this has happened in your home, contact us to find out more about our automatic gate repair services. If your gate has failed due to an accident and is undermining the safety of your property as a result, there is no time to wait around for a technician to pencil you in. We understand that matters of security need to be dealt with quickly, which is why our technicians offer same day emergency services for callouts on unexpected failures. Keeping your gate in good condition will ensure that your home is properly secured, and will also add a certain aesthetic quality to your property. If you would like information on the various gate repair services that our team of technicians can provide you with, contact a representative from Garage Door Repair Encinitas today.